This post offers info on top 10 scuba diving destinations and best scuba dive sites in the world. Scuba diving is a form of underwater diving in which a diver uses a self-contained underwater breathing apparatus (scuba) to breathe underwater. A scuba diver usually moves around underwater by using fins attached to the feet, but external propulsion can be provided by a diver propulsion vehicle, or a sled pulled from the surface. Scuba diving is an excellent way to see some amazing and beautiful sites. Tropical coral diving destinations are most popular for colourful sea life, however other scuba diving attractions include tropical and temperate rocky reefs, shipwrecks, caverns and caves. Many best scuba diving sites are accessible (under the care of an instructor) after a short briefing and training dive. Check below the top 10 scuba diving destinations in the world as well as also learn about best scuba diving sites and decided for your next diving underwater trip. Costa Rica is bordered by the Pacific Ocean and the Caribbean Sea in the heart of Central America. It is a prime ecotourism destination. It is widely recognized as one of the world's most biodiverse nations. Costa Rica is among a top scuba diving destinations in the world, especially along the Pacific coast, where crystalline waters are home are home to a variety of marine life. Cocos Island : Just four miles long, peaking at 3,000 feet, this island, is a UNESCO World Heritage Site and a top diving destination. "Scuba Travel" and "The Guardian" list Cocos Island as one of the world's best. Caño Island : Offers some of the most exciting diving anywhere in the world. A wide variety of marine life can be discovered. Catalina Islands: well known for finding some manta rays, sharks, multi-colored tropical fish and amazing coral reefs. Bat Islands (or Islas Murciolago): Large shark species like bull, tiger and whale sharks, as well as manta, eagle and devil ray can be found here. Fiji,is an island country in Melanesia in the South Pacific Ocean. It lies about two-thirds of the way from Hawaii to New Zealand and consists of an archipelago that includes 332 islands. Fiji is an amazing tourist destination. For the diving lovers, it offers some of the World's best scuba diving with a comprehensive range of excellent dive locations. Taveuni and the Koro Sea : Dive the amazing Rainbow Reef, The Great White Wall, The Purple Wall, The Zoo, The Fish Factory and many others. Wakaya and Namena in the Koro Sea is Fiji's best claim as a world class dive destination and is a prime adventure cruising ground for liveaboards. Beqa Island (Beqa Lagoon): Famous for its firewalkers and turquoise lagoon. Kadavu : The best diving destination in southern Fiji, explore the rugged untamed reefs of Kadavu's Great Astrolabe Reef where mantas play over vast fields of pristine hard corals. Rakiraki, Viti Levu: Offers divers access to colourful pristine reefs and an abundance of fish. Mexico is a country in North America, between the USA to the north, and Guatemala and Belize to the southeast and a diverse landscape of mountains, deserts and jungles. Its extensive coastlines of more than 10,000 kms include the Gulf of Mexico and the Caribbean Sea to the east and the Pacific Ocean to the west. If you are interested in the exciting open ocean dives then a liveaboard cruise in the Pacific is the best choice. Mexico is among the top 10 scuba diving destinations in the world. For land-based diving and other tourist activities, look to the Caribbean Sea. Islas Marias: An island off the pacific coastline of Mexico, it is a great scuba diving site. The deep and clear waters of the Pacific give a great view of the life underwater. Baja Peninsula: The town of Coba is the paradise for experienced scuba divers. Coba is situated at the tip of the Baja peninsula and offers a wide range of diving options. Puerto Vallarta: Popular spot for scuba diving along the pacific coastline. Clear waters and scattered reef system. Acapulco: The low temperature of water here offers a different kind of challenge for scuba diving. Here you would want an expert diver escorting you. Riviera Maya and Costa Maya: The best place for a great scuba diving experience. At the meeting point of the Caribbean Sea and the Yucatan Peninsula it offers warm and clear blue waters, excellent for both beginners and professional divers. Cancun: Ultimate tourist spot with all its fun and adventure activities. Access more than 400 submerged sculptures of the biggest underwater museum in the world. Isla Mujeres: 6 kilometer island off the coast of Cancun various of fun activities including scuba diving. Cozumel: Popular scuba diving and snorkeling destination which is famous for its ‘balneario’ or seaside resort town. Cozumel allows you to do some deep wall dive as well as drift dives. Puerto Morelos: See the natural and artificial reefs and also the coral covered gunboat. Banco Chinchorro: The secluded and protected area. See the amazing colors of the reef in coastal waters. Wide range of fish and other marine animals can be seen here. Anton Lizardo: Relax on the pristine beaches and go diving as per your convenience. You can also explore the Veracruz reef here. It is a different ecosystem altogether untouched by heavy tourist activities. The rich history of the Red Sea is matched by the richness of its waters and the abundance of marine life it supports. It is considered to be one of the 7 Wonders of the underwater world, harbouring more than 1,000 species of invertebrates and over 200 species of soft and hard coral. Almost all dives in that area are walk-ins, visibility is regularly 20 to 30 meters, and the color and variety of the underwater life is spectacular because the coral is still in excellent condition. The Red Sea dive sites offer you unobstructed opportunities to spot tropical marine life in crystal clear waters, ranging from sharks and dolphins to gorgonian fans and feather-stars. 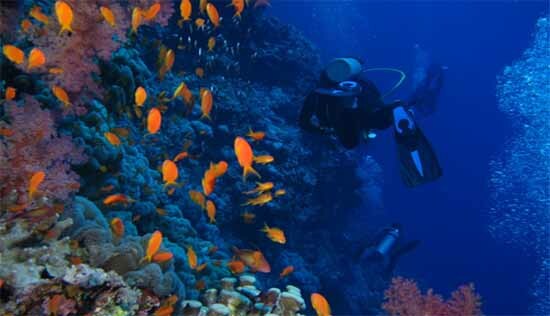 Red sea is yet another best places to scuba dive in the world. North Red Sea: The resort destinations such as Sharm El Sheikh, Hurghada and the more laidback Dahab. Sharm El Sheikh offers excellent wreck diving , Hurghada offers good conditions to learn scuba diving as well as great wreck diving with 4 beautiful wrecks to explore in Abu Nuhas Reef. Dahab is famous worldwide for the Dahab Blue Hole. The South Red Sea is less popular and offers much less crowded dive. Most of the people coming here are experienced divers looking for world class scuba diving. Marsa Alam is the main gateway. With 18,110 islands, 6,000 of them inhabited, Indonesia is the largest archipelago in the world. Indonesia is known for its pristine diving and incredible underwater experiences. It is possible to dive in Indonesia all year round. Although it is important to know weather conditions varies greatly from place to place so it is advised to conditions in advance. Bali: Most popular tourist resort island has plenty of options for scuba divers of all levels of experience. Deep walls, drift dives through deep water channels, coral reefs, volcanic muck diving, a world famous wreck, mola mola and mantas, best island scenery makes it a popular dive destination. The Gili Islands Lombok: Good for beginner divers as the conditions are usually good. The visibility good around 20 meters. Water around the Gilis are full of turtles. Komodo: Best for intermediate to advanced divers.see a multitude of fish and some larger pelagics and marine mammals such as mantas, dolphins and sharks. Sumatra: Place to see clown fish, turtles, stingrays, moray eels and black snappers hanging between the rocks. Wakatobi, Sulawesi: Home to creatures ranging from the small and strange to giant mantas and resident turtles.Accessible coral garden at Teluk Maya harbors Pegasus sea moths and pipe fish. Many sites feature thick forests of vibrant soft corals, which hide lots of animals. Raja Ampat, Papua: Richest place for Marine life. Magnificent hard and soft coral, clear water and a teeming reef life. spot many Sharks, Giant Trevally or the Dogtooth Tuna, very rare Dugong and more. Lembeh, Manado & North Sulawesi: Offers a plethora of dive sites and is suitable for divers of all experience levels. Palau, is an island country located in the western Pacific Ocean. Palau is a chain of 200 islands in the western Pacific lying some 650 km (528 miles) to the southeast of the Philippines. Currently rated as the “hottest dive spot on planet earth,” Palau is well-known for its quantity of pelagic and strong currents. It is home to large permanent schools of barracuda, large numbers of fairly harmless grey, white-tip, and black-tip reef sharks, and sea turtles. Palau’s most famous and best scuba diving sites. Australia is an Oceanian country comprising the mainland of the Australian continent, the island of Tasmania, and numerous smaller islands. Australia, one of the top scuba diving destinations in the world, offers some of the best diving in the world. It is most popular for the Great Barrier Reef, Great White Shark cage diving and the Ningaloo Reef where you can swim with Whale Sharks. Water clarity varies greatly depending on the area and time of year. Queensland & The Great Barrier Reef: A long tropical reef system off Far North Queensland, is Australia's biggest dive attraction. Home to the Great Barrier Reef, which is the largest coral reef system in the world. Victoria: Encounter beautiful marine life including cuttlefish, octopus, giant sea stars, rays, sea horses and even seals. South Australia: Bio diverse temperate waters offer amazing shore dive opportunities under the many jetties in and around Adelaide, as well as some stunning wreck dives. Western Australia: Home to 200 species of hard coral, 50 soft coral and over 500 species of fish. Tasmania: known for its natural and untouched beauty. The many wrecks, huge rocks structures, caverns and endemic marine species make diving in Tasmania an adventure. Water has visibility between 10 to 40 metres. Northern Territory: The coral reefs off Darwin have a rich diversity of reef fish and invertebrates, and Australia’s best collection of World War II shipwrecks. Maldives, is an island nation in the Indian Ocean–Arabian Sea area, consisting of a double chain of twenty-six atolls, oriented north-south, that lie between Minicoy Island and the Chagos Archipelago. Scuba Diving around the Maldives has become hugely popular among the diving community. The hundreds of isolated and deserted Islands offer an enormous playground for divers to explore. The Male Atoll is divided into 2 sections, the North Male Atoll and the South Male Atoll. They are both located on the eastern side of the Maldives. The South Male Atoll is home to a number of tourist resorts and some of the finest scuba diving in the Maldives. One of the most developed atolls in terms of hotel and resort development. There are at least 20 resort islands operating in the North Male Atoll. It is also home to some excellent diving spots. The only area in the Maldives that was not affected by the 1998 global coral bleaching.Those who want to dive at Maldives biggest wreck British Loyalty, with large manta rays, eagle rays, sharks, turtles and generally big fish all year around, well be delighted. There are four kandus in the atoll: Gan kandu, Viligili Kandu, Maa Kandu and Kuda Kandu. Explore here (External link to Wikipedia) for more info on Diving in the Maldives. Iceland, is a Nordic island country between the North Atlantic and the Arctic Ocean. Iceland has some of the most amazing and unique dive & snorkel sites. Diving in Iceland is a challenging but exhilarating activity, mostly because of the cold conditions all year round but it is definitely worth it and will be a memorable experience. The Silfra rift is one of the best dive sites in the world. The Cayman Islands are a British Overseas Territory in the western Caribbean Sea. The territory comprises the three islands of Grand Cayman, Cayman Brac and Little Cayman, located south of Cuba and northwest of Jamaica, is known for its beach resorts and varied scuba diving and snorkelling sites. It provides a great opportunity to see a wide array of saltwater creatures from stingrays to angelfish. It is also known for having good weather condition all year round. Cayman Brac is popular for deep-sea fishing of tuna, marlin and barracuda. Check some other scuba diving locations and dive sites below. Offers more than romance when it comes to its underwater menu. Often called as the “Shark Capital of the Pacific”. Scattered over a large area of the Pacific, the islands of Micronesia offers different kinds of dive experiences. Landing is not permitted on these islands, liveaboards are the only way to tap such awesome experiences. Located off the coast of the Malaysian state of Sabah, this is where giant sea turtles swim alongside schools of sleek reef sharks, and vertical walls drop thousands of meters from the edge of powder-soft beaches into mysterious blue depths. For divers who are looking for a diverse ecosystem, Belize offers a great number of reefs. Clear waters and untouched reefs, drop offs and dunes. Thailand, which is known as the “Pearl of the South,” is famous for its marine life teeming coasts. From Phuket to Phi Phi, Krabi and the Similan Islands, Thailand boasts some of the best and most accessible scuba around. It stands out among its sister islands Aruba and Caracao for being a spectacular scuba diving destination. Malaysia is now a haven for divers eager to see for themselves the wonders of Sipadan and Mabul. Schooling hammerheads, mantas and critters galore all await you here. Malaysia’s only oceanic island is a tiny dot in the South China Sea. Underwater it is a magnet for fish: schools of barracuda, trevally and horse-eye jacks swarm over the reefs. The main attractions are the Belize Barrier Reef and its beaches. That barrier reef is the second largest in the world, after the Great Barrier Reef of Australia. Surrounded by deep blue water and quite distant from the nearest reef structure, Bradford acts as a magnet for big fish and pelagics. An island in the Tuamotu archipelago in French Polynesia. It is the second largest atoll in the world. Scuba Diving is breathtakingly fabulous in and around the Tiputa pass, with dolphins, sharks, manta rays and turtles. You can explore here (External Link to wikitravel) if you are looking for the complete list of Scuba diving destinations in the world. You can help in editing this post. Please share your thoughts/changes (if required) through comment. Great post to know about some of the best destinations to go diving in the world. Nothing in this world could compare to the thrill experienced by delving a different world through scuba diving. The best moment for any diver is getting up close and personal with the marine life. I think the list of top 10 scuba diving destinations with info on diving sites in the world mentioned in this post, have been known to consistently provide optimal conditions and unique memorable experiences to everyone, every time.